The only double-sided coater that gives excellent smoothness, meaning no filmsplit. This coater can apply up to 25 gsm per side, i.e., the job of 4 blade coaters. TWIN ABC™ executes the blade coating process on both sides of the web in a single step. This is achieved by positioning two blades as mirror images of each other, one on each side of the paper web, with their tips separated only by the thickness of the web. The ABC™ principle loads the blades at the very tip, keeping them completely straight during all phases of operation and at all blade pressures and angles. Since the blades never bend, the position and angle of each blade tip is always known and under accurate control with precise alignment and repeatability. The profiling is achieved by adjusting the blade pressure of one of the blades against the other. 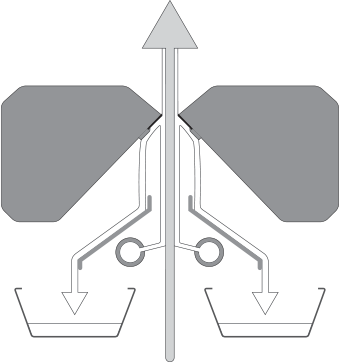 The individual pneumatic actuators across the width of the web ensure a uniform profile. 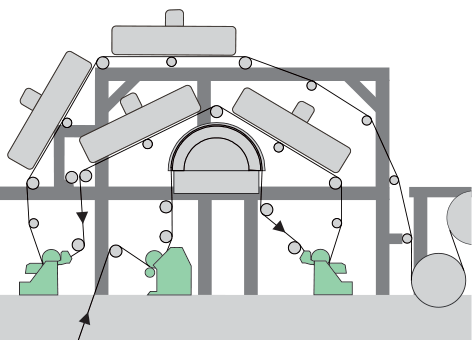 With equal and simultaneous wetting of the paper or board on both sides, the subsequent drying does not produce the stresses that cause curl. In a downward web run, the blades come together forming a V-shaped pond with the web running vertically down between them. The coating pond, with a full-width overflow system, applies coating evenly to the paper surface with an absolute minimum recirculation rate. Piping, filters and pumps can be dimensioned accordingly. 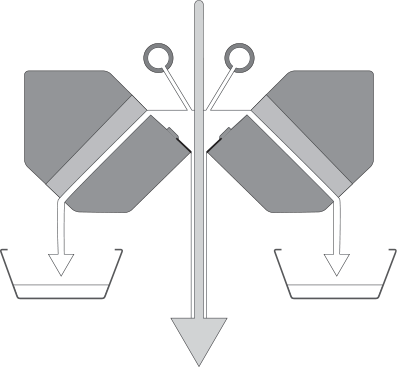 This method is ideal for simultaneous double-sided coating. The TWIN ABC™ in an upward layout can be utilized for both differential and double-sided applications. The ­coating color is added by Jet applicators on each side of the web, the benefit being perfect side-to-side ­color ­separation. By the addition of one coating layer, new opportunities are ­available within existing coating sections. 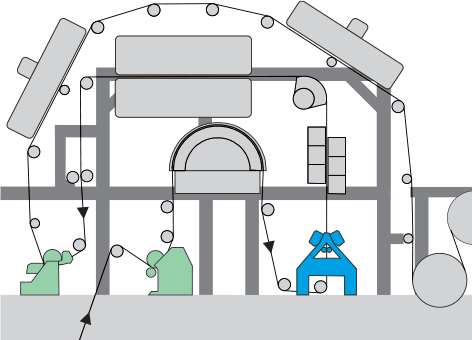 The TWIN ABC™ total installation cost could be estimated to one third compared to installing two new coating stations. Maintenance requirements are also substantially less as the ­TWIN ABC™ does not need any rolls or drives.